Unfortunately, the dress you are looking for (Style: DQ-9718m, Name: DQ-9718m) is no longer available. Both beautiful and versatile, this long mocha prom dress is sure to receive endless compliments at black-tie events. Softly romantic as a wedding-guest dress or pageant dress, this figure-flattering formal dress has impressive details. 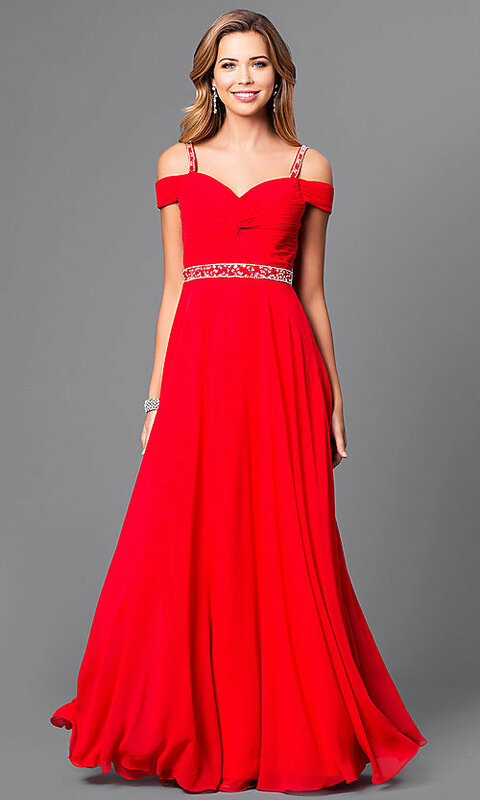 The sweetheart prom dress features a trendy cold-shoulder neckline with jeweled shoulder straps that add sparkle as well as support. The chic sweetheart bodice has a ruched knotted detail and draped banded sleeves that add an alluring look. The stylish back-corset feature laces up for an ideal fit to this lovely evening dress. The figure-flattering long a-line skirt, in layers of silky chiffon, is crowned at the natural waistline with sparkling rhinestones, tonal beading and shimmering sequins. At under $150, this long mocha prom dress blends affordability with impressive style for prom 2019.